Save $10 on each charm when you buy 2 or more charms or Initialed sets. Made in the USA. 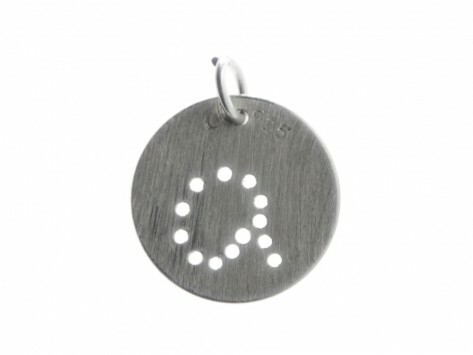 The sterling silver charms are monogrammed with lower case letters that are scribed, pierced, and sanded by hand. I get comments and compliments on my necklace with 2 charms on it everywhere I go. Absolutely love it! My son passed away unexpectedly on Dec. 26th. His first and middle names started with an “E,” so we called him ”EE,” when he was young, but we would write the letters in lower case because his middle name was given for my husband’s favorite poet, e.e.cummings. I ordered the necklace set, with an “e” charm, and an extra “e” charm. I love them and wear them every day. Thank you for the great workmanship! I would like to suggest, though, that a different clasp be put on the chain. The current one is too small and very difficult to open.